If there’s one adjective to describe lawn weeds, it’s tenacious. Weeds such as crabgrass and broadleaf weeds are hardy and happy to keep trying over and over again to take over lawns in Allentown, Bethlehem, Easton, PA and surrounding areas . The lawn care team at Joshua Tree takes great pride in tackling the crabgrass and weed control challenge head on! We work from spring into fall, using both proactive and reactive crabgrass and weed control treatments – depending on what your lawn needs at any given time. 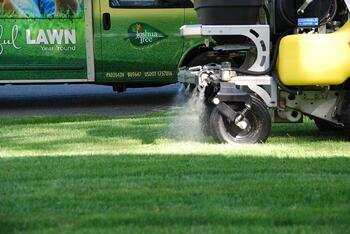 Broadleaf lawn weeds and crabgrass are addressed with each of our lawn maintenance programs, in varying degrees. These five, six or eight visit program options include preventative treatments, weed control sprays, and treatments to thicken your lawn to make it even harder for weeds to invade your yard. 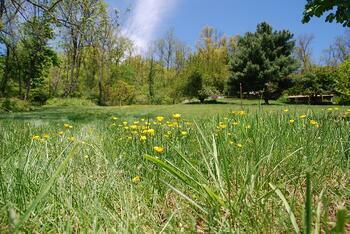 Each year, your lawn will be susceptible to crabgrass and weeds invading thinner areas or spots near edges. Our lawn maintenance programs are specifically designed to target these spots, while your lawn thickens over the years to naturally reduce lawn weeds. Certain years have increased weed pressures due to weather-related conditions. The great news is that our lawn care programs include free service calls! In the rare instance where covered broadleaf weeds or crabgrass are still persisting, just let us know and we’d be happy to return to spot-treat them free of charge. If your lawn is being taken over by weeds, the team of lawn care experts at Joshua tree are ready to help. We do provide individual weed control treatments, but most of our clients find that using one of our three lawn maintenance programs do an outstanding job at keeping their lawn looking their best, all while including other valuable services in their lawn care pricing. One of our team would be happy to walk you through whatever option seems best for you.